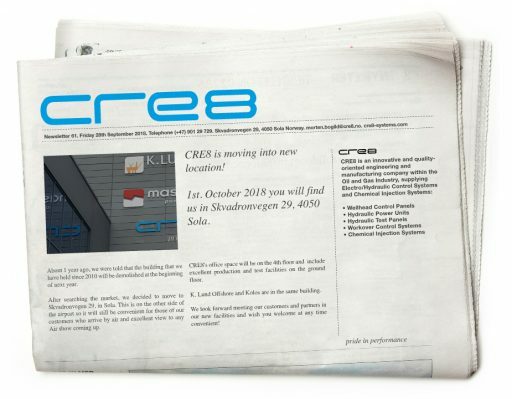 CRE8 is moving into new location! About 1 year ago, we were told that the building that we have held since 2010 will be demolished at the beginning of next year. After searching the market, we decided to move to Skvadronvegen 29, in Sola. This is on the other side of the airport so it will still be convenient for those of our customers who arrive by air and excellent view to any Air show coming up. CRE8’s office space will be on the 4th floor and include excellent production and test facilities on the ground floor. K. Lund Offshore and Kolos are in the same building. We look forward meeting our customers and partners in our new facilities and wish you welcome at any time convenient!